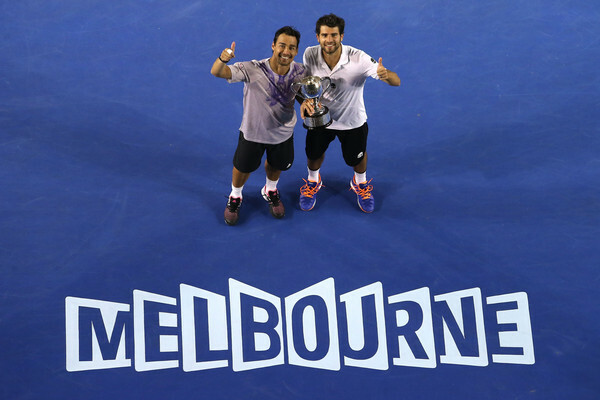 The 2015 Australian Open concluded in a manner that proved satisfying even as it felt inevitable: Fabio Fognini and Simone Bolelli claimed their maiden Slam doubles title, just as we all predicted they would. More surprisingly, the singles title was won by world number one and strong pre-tournament favourite Novak Djokovic, who contrived victory despite rubbery thighs, a mangled thumb, some kind of virus, his coach, and an overwhelmingly strong record against all of his opponents. 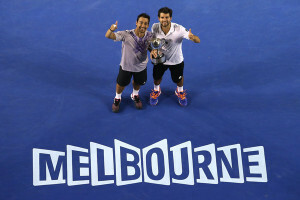 It is the Serb’s fifth Australian Open title, a record for the Open Era. Bolelli and Fognini meanwhile are the first Italian male pair to win any Major since 1959. They immediately announced their ambition to attend the World Tour Finals in November, Fognini being a long-term commitment kind of guy. Until he lost, and even for a while afterwards, Nick Kyrgios was the talk of the tournament. He eventually fell to Andy Murray in the quarterfinals. Bernard Tomic meanwhile lost a whole round earlier to Tomas Berdych, and wasn’t the talk of the tournament. No one thought to mention how their results would likely have been reversed had they swapped draws. What if Tomic had faced Andreas Seppi in the fourth round, instead of Berdych? What if Kyrgios had faced Philipp Kohlschreiber near his best in the second round, instead of Ivo Karlovic at his worst? There’s little point in dwelling on what might have been, but we shouldn’t forget that luck plays its part, especially when determining which player enjoys the warm glow of the nation’s affection. Australia’s most popular media outlets only encourage this seasonal lunacy. 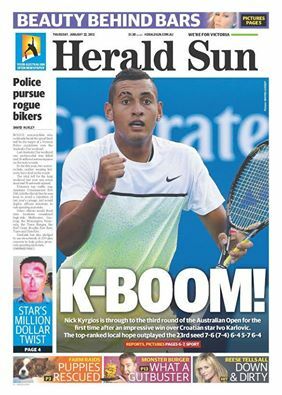 They’d already accelerated to a patriotic gallop when James Duckworth beat Gilles Simon in Brisbane – imagine CBS going bananas at Jock Sock winning a round in Winston-Salem – and the pace barely slackened until Kyrgios left Melbourne. It helped that for once there was plenty to celebrate: of the 128 singles players who passed the first round at the Open, eleven of them boasted little Australian flags next to their name, a flowering of home-grown and imported talent that was commemorated with typical reticence on the front pages of the local tabloids. It even prompted Channel 7 to work some tennis into promos for their nightly news bulletin, which are otherwise compiled from whatever grainy footage of urban violence they’ve scrounged up that day (a habit noted by visiting athletes). For Channel 7, any Australians lingering deep into the tournament provide a ratings boost not only for the duration of the event itself, but for the remainder of the year: the longer the locals endure, the higher the number of viewers exposed to relentless promos for their upcoming suite of unmissable shows. Prominent among these is the ridiculous My Kitchen Rules, a reality cooking show that invites us to worry on behalf of the kinds of people who’ve pinned their hopes on winning a reality cooking show: “We need this … cos of our dreams,” sobs one contestant, meaning it. Another contestant can apparently speak to turkeys. Then there’s the unending Home and Away, set in an idyllic beachside hamlet whose population has remained constant for decades, despite a ceaselessly regenerating cast of attractive youths. According to the ads, a bus rolls over in the new season, though sadly only one of the attractive youths is on board. “I won’t lose another brother,” sobs another attractive youth. He’s either related to the dude on the bus, or just very absent-minded. As unkind as I am about Channel 7, the parts of the tennis coverage not devoted to commercials and sundry self-congratulation actually showed an improvement over previous years. For one thing there was the new 7Sport app (and website), which allowed users to watch any of the dozen or so televised courts, several of which had commentary. The exposure this gave to players toiling on outside courts shouldn’t be underestimated: for a time 7Sport was the most downloaded app from the iTunes store, and one imagines that at least proportion of users showed some curiosity about the action occurring away from the main stage. For another thing, hosting duties have passed to the capable Hamish McLachlan, whom Australian viewers might otherwise know as the host of AFL Game Day. As the designated network guy, McLachlan combines an easy-going levity with an obvious passion for tennis and wide range of cultural reference. Of course, next to most of the commentary team just about anyone would sound like Stephen Fry. Rennae Stubbs at one point declared: ‘That was the very thought I was thinking.’ During Kei Nishikori’s second round match McLachlan pointed out to John Fitzgerald that professional tennis is a meritocracy. Fitzy’s first response was panicked dead air, soon followed by the admission that he didn’t know what meritocracy meant. McLachlan helpfully explained how it differs from aristocracy. Even then, Fitzgerald could contribute little, since he so obviously only watches tennis a few times a year. “Yeah, one that’s gonna knock you out!” chimed in booth-mate Peter Lonergan, doing his part to drain the cliché of its already meagre nuance. “He’s really started going for a broke a little bit,” added Fitzy, just warming up. Given that Hewitt is still (nominally) an active tour player, it is understandable that he is less critical in his commentary than some of the retired pros. Refreshing though it might prove, it probably wouldn’t do to have him excoriate his peers on air. Something like that would surely get back to the locker-room. However, while his continuing role as a tour professional precludes him from being completely candid – even about Chela and Nalbandian he would go no further than to say he never practiced with them; a rare example of wry understatement – it also provides him with his most interesting material. At his best Hewitt offers insights available nowhere else. When he first began commentating for Channel 7 a few years ago he came toting a duffel bag of fresh anecdotes. Did you know that Nadal is as competitive on the golf course as on the tennis court? Or that Ferrer was once too shy to ask Hewitt for his autograph? Although the duffel bag has lately seemed a little depleted, there is still the occasional trinket. During the first of the men’s semifinals Hewitt remarked that during the IPTL he shared a team with both Tomas Berdych and Andre Agassi. He related that one day during practice Agassi took the Czech aside, though not so aside that Hewitt couldn’t overhear, and told him that his second serve simply wasn’t good enough, and that it was this shot that had thus far stopped him from breaking through for a Major. 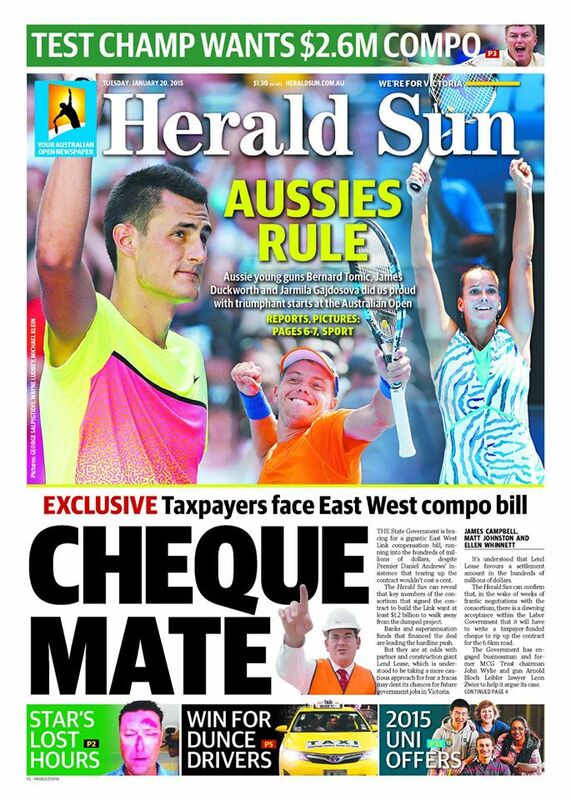 It’s this kind of material that might dry up once Hewitt is no longer in the thick of the action. McLachlan’s elevation to the role of host freed Bruce McAveny for other duties. These commenced disastrously at the draw ceremony – Li Na clearly found him baffling, and seemed determined to be as difficult as possible – and continued through a fortnight of matches on Rod Laver Arena. Bruce has always had a passion for statistics, and in his prime would make sure use of them in rendering the onscreen action comprehensible for viewers. The relevance of statistics generally lies in the connections they establish. Bruce hasn’t lost the ability to form those connections – he has lost the ability to stop making them. Consequently he has gained the fatal habit of rambling on at least one clause too far. After Murray and Berdych fought out a 76 minute opening set, McAveny reminded us that Grigor Dimitrov had beaten Dustin Brown in 69 minutes in the opening round, which was fine, until: “And of course Murray beat Dimitrov in the fourth round here.” In isolation it doesn’t seem like much, but it happened nearly every time he spoke: another tiny plank of irrelevance in a groaning structure of aimless erudition. ESPN already has the finest tennis commentator in the world in Darren Cahill, and did itself more favours by enlisting Jason Goodall to provide expert analysis in a series of segments that invariably yielded real insight. Channel 7 had similar segments: called ‘Back to School’, they were sponsored by Office Works, hosted by Roger Rasheed, and were generally worthless. The real shame was that they needn’t have been. Ideally Geoff Masters would have hosted them. Masters is affable, well-spoken and boasts an intimate knowledge of the game stretching back decades. (7’s best commentary of the summer came when Masters and McLachlan paired up for a match in Brisbane, though there was one clanger when Masters remarked of one player that a transition game “wasn’t in his tennis DNA … at least not yet.”) Instead we got Rasheed in a tight polo-neck, whose every utterance sounds like a fridge magnet devised by a My Kitchen Rules contestant. Before the quarterfinals he explained that for Djokovic to win, the Serb “mentally just has to be so strong in his mind”. That was the very thought I was thinking. Thanks for the posts, Jesse. I’ve been living in Ohio for 6 months now, so reading your blog has made me feel very nostalgic! A massive amount of nostalgia, in fact. It’s always fun to learn just how much of our lingo we don’t share with other countries; for example, Americans always laugh when I say “THE tennis”, “let’s watch THE football”, etc. I was very impressed with the ESPN coverage (Jason Goodall was great), except for the obvious fact that no ESPN commentator can last 30 seconds without hearing his own voice. Their capacity to fend off threats of awkward silence with obscure hypothetical thinking is second to none. On another note, they had nothing but praise for Kyrgios, which was a refreshing contrast to the inane concerns of the Australian media. My highlight of the tournament was an obscure one: the 5th set of a 1st round match between Lopez and the American Denis Kudla, which featured very high quality tennis and a lot of drama. Kudla served for the match at 6-5 and held 4 match points after leading 40-15, only to see Lopez save them with some ridiculous points and shot-making that could only be described as “tremendous”. Lopez held match points of his own 2 games later, and Kudla was terrific in achieving a tough hold. But from then on the damage was done, and Kudla fought valiantly to stay even with Lopez for another 2 games. Thanks again for taking the time to write these posts. As always, tremendously entertaining. My pleasure. Glad to hear that I contributed to your nostalgia, though I bet seeing images of warm blue Melbourne courts in the middle of the wintry Ohio night did its part. Unusually for Ch7, and I forgot to mention this in the post, but there was actually a lot more silence than usual during the commentary this year. At times it was almost like the BBC (who go entire games with nary a peep, unless Boris Becker is on deck, in which case it’s a constant dribble of faux-profound idiocy). Even Courier would go silent. Eventually Bruce would chime in to give us some stats on the longest stretches of commentary silence in tennis matches. I wish I’d seen Lopez – Kudla. All I saw of Lopez was the loss to Raonic, and the moment when he hit a ballkid in the groin, which got replayed endlessly. Even that 4th set tiebreaker against Raonic was pretty fantastic, especially Lopez’ backhand pass to save match point. Navak Djokovic, Australian Open Champion… no one could have been thinking that thought… and this, despite so much adversity, including his coach….! Precious. My pleasure, Eva. Glad it made you laugh! Totally agree with you about Cahill being the best commentator. I wish he could do all the matches ESPN shows! I love the way he is so fair and balanced in his commentary and gives a good technical analysis of how the players are playing. I usually learn something from his commentary. Now, if the ESPN commies could just learn that the occasional silence is just fine. We can enjoy listening to the sound of the ball being struck. We should start a Kickstarter to clone Cahill, then put him on the BBC, where they go whole games without a single word. Massive article Jesse. Just massive. New visitor here, attracted by your description of Moya vs. Nadal (somehow got there watching tennis on youtube, funny how things work). I enjoy your in-depth commentary as a ‘massive’ fan of tennis, keep it up. Did Agassi really say that to Berdych?